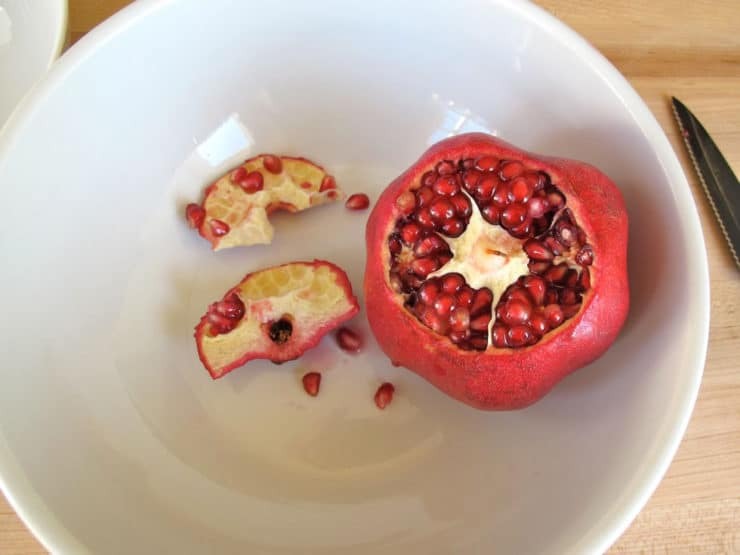 Learn how to easily seed a pomegranate and juice the seeds! 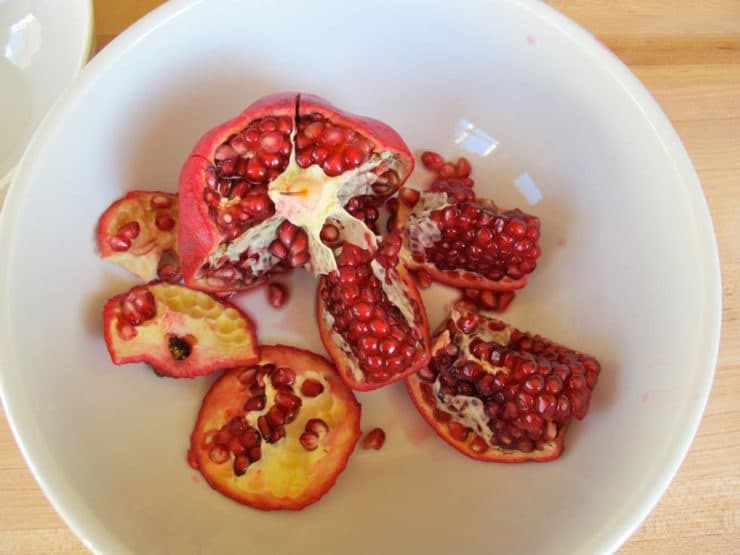 In this post I will walk you through my tried-and-true methods for removing seeds from a pomegranate, and the easiest way to juice the arils. 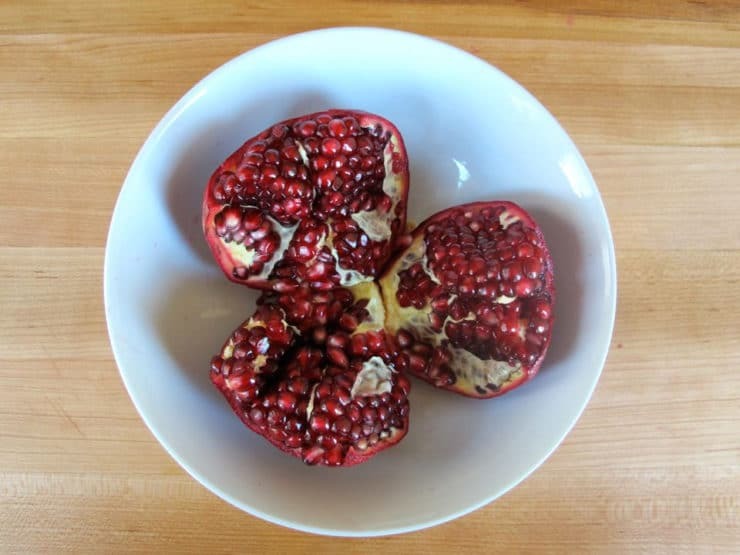 For the first few years that I made our Rosh Hashanah meal, the task I dreaded most was seeding the pomegranate. 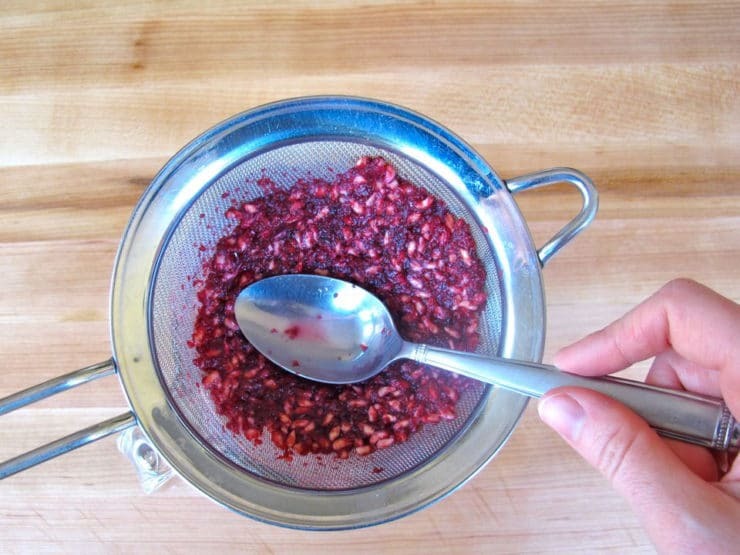 Extracting the itty bitty juicy red seeds (also known as arils) from a pomegranate can be a daunting task. I used to peel the fruit and navigate my way through it, staining my clothes and squishing lots of seeds along the way. 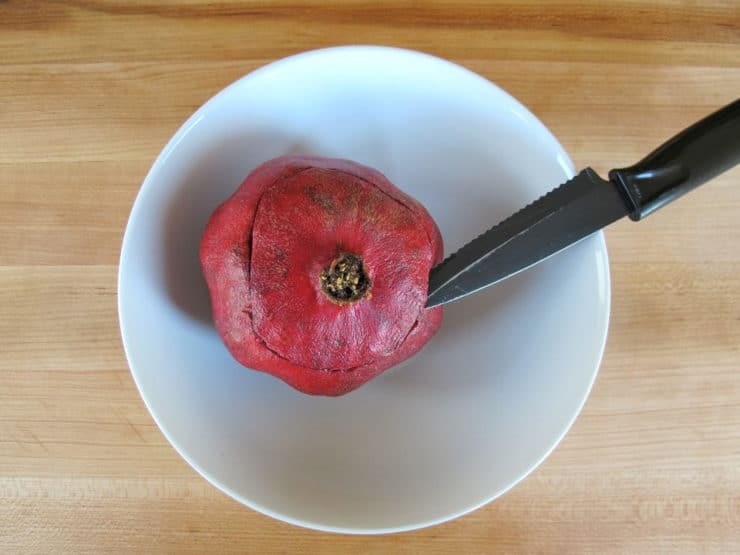 Since that time, I have learned some helpful methods that make seeding pomegranates a snap! 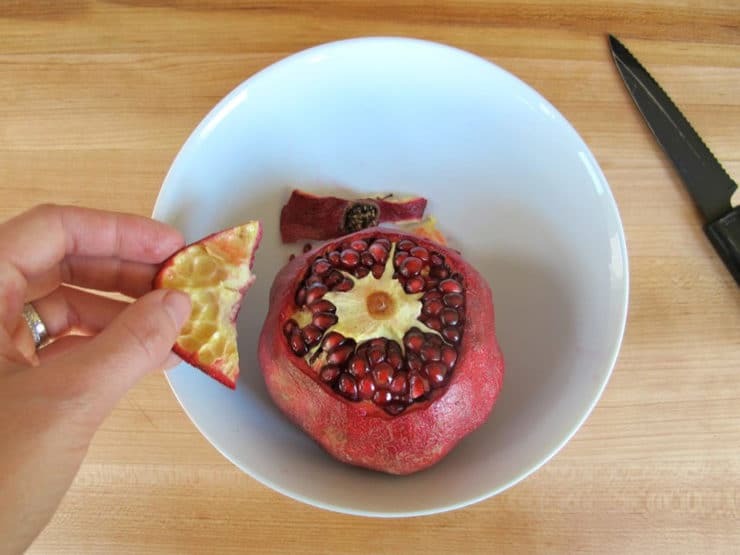 There are many ways to seed a pomegranate. I’ve outlined two of my favorite methods below. The first method is fastest, but you will lose a bit of juice in the process. The second method takes a bit longer and is messier, but you won’t get pruney hands from deseeding underwater. Either method works, so choose what makes the most sense to you. Seeding your own pomegranates sure beats paying a premium for boxed seeds, which can go for as much as $6 for a small box. It’s also really simple. 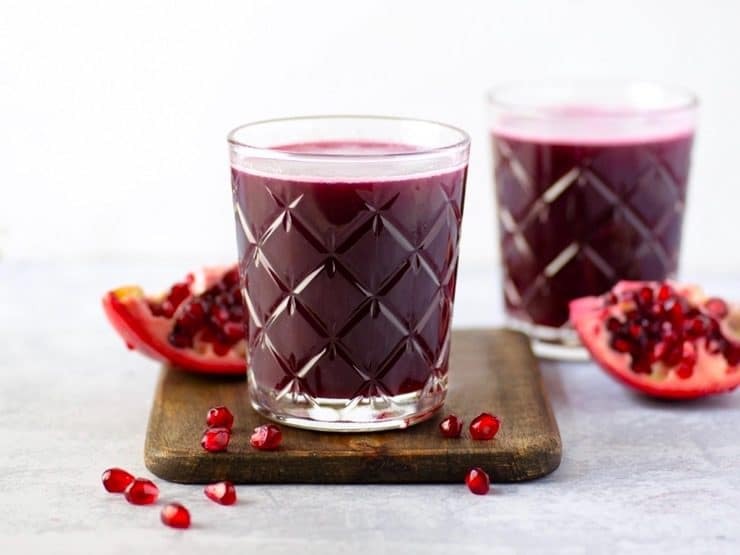 Once you’ve extracted all your pomegranate seeds, you can eat them whole or juice them. I’ve described my favorite simple juicing method below. 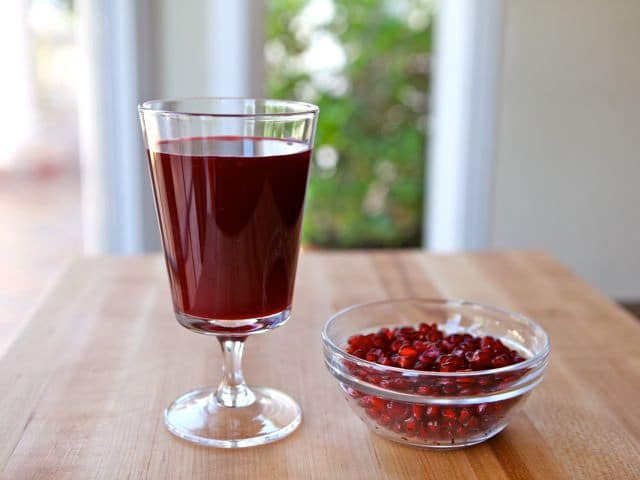 Pomegranate juice is very healthy (it contains more antioxidants than red wine), but it can be expensive. 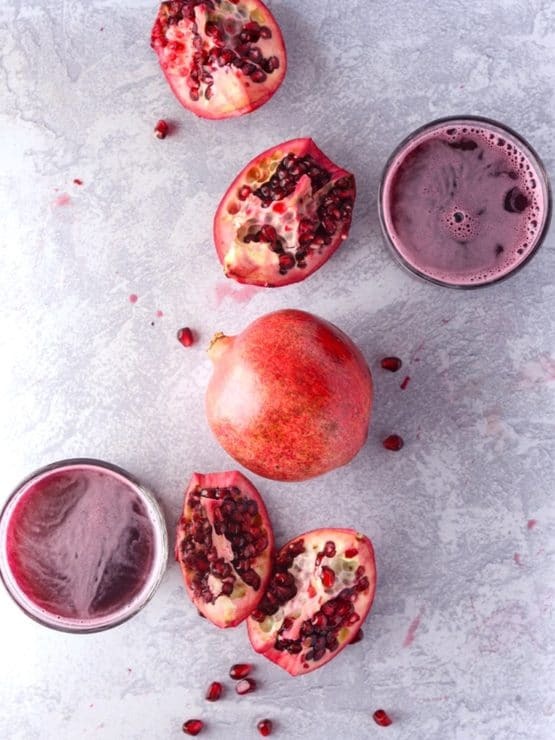 One pomegranate contains up to a half cup of juice, so you can really save yourself some money by juicing your own pomegranates. 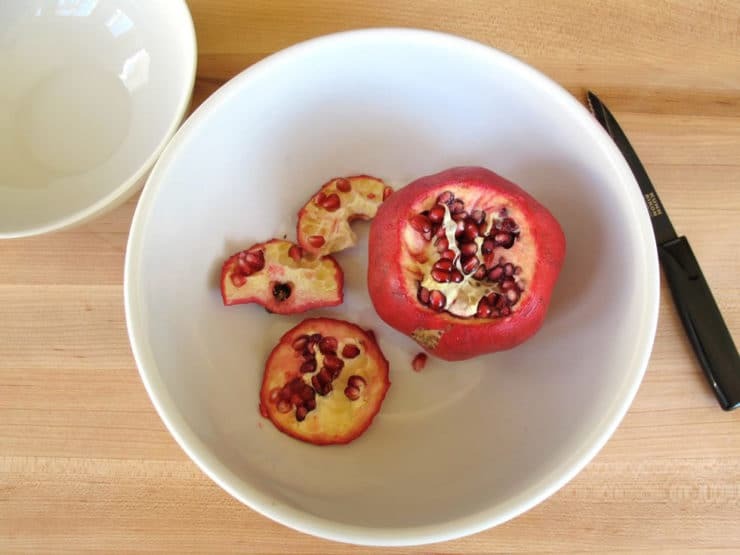 Learn two methods for extracting seeds (arils) from a pomegranate, and learn how to juice the pomegranate fruit quickly and easily. 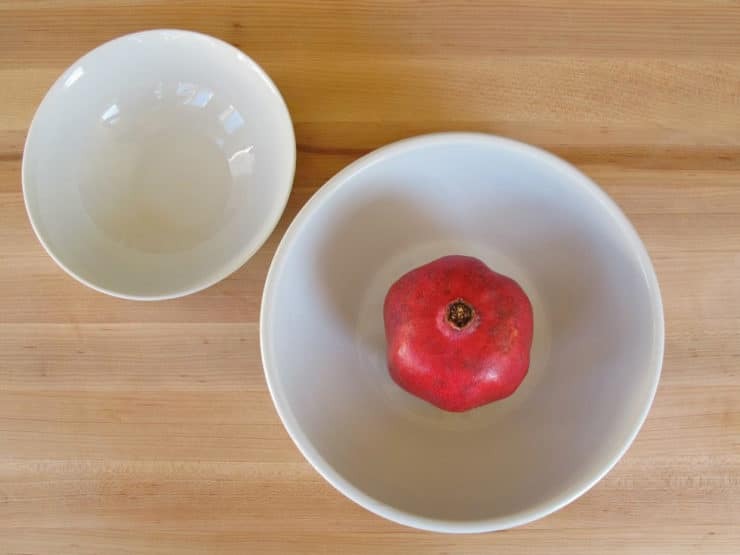 Make a shallow slit at the top of the pomegranate where the knob/stem is (this part is known as the crown). Cut all the way around the top of the rind, creating a shallow circle. Don't push the knife in too deep, or you may burst some seeds. 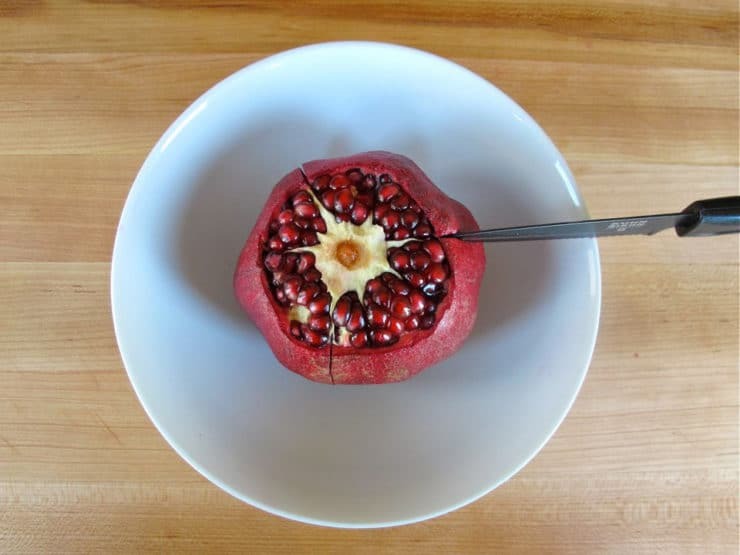 Pull the crown of the pomegranate off to reveal the inner seeds. Cut three shallow slits through the outer rind, following three of the white pith lines, from the top of the fruit to the bottom. Pull the fruit apart to create three large sections. Remove any large pieces of pith that are visible. Submerge the sections in a large bowl of cold water. Break apart the sections underneath the water, separating the seeds from the rind and pith. As you remove the seeds, they will sink to the bottom of the bowl. The pith will rise to the top and float. Discard the large chunks of rind (the peel). 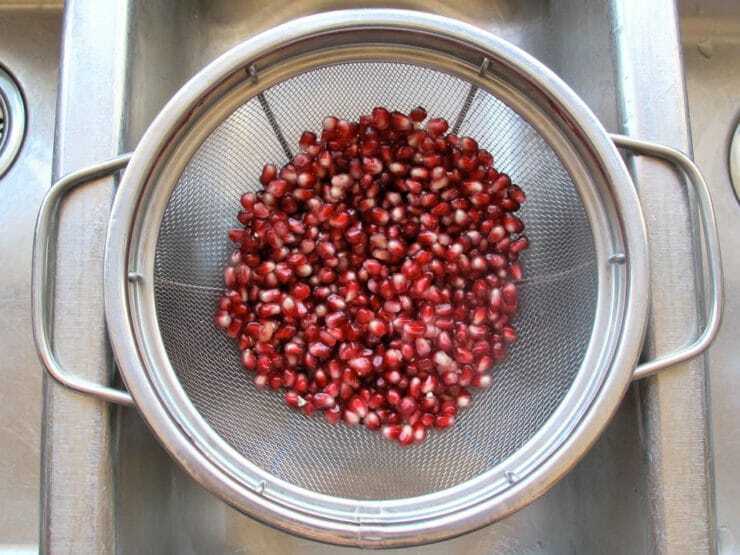 When all the seeds have been removed, use a mesh strainer or slotted spoon to remove the floating pieces of pith from the surface of the water. A few seeds may float as well; separate these out and return them to the bowl. Drain the seeds in a colander. Remove any additional pieces of pith that may have mixed into the seeds. 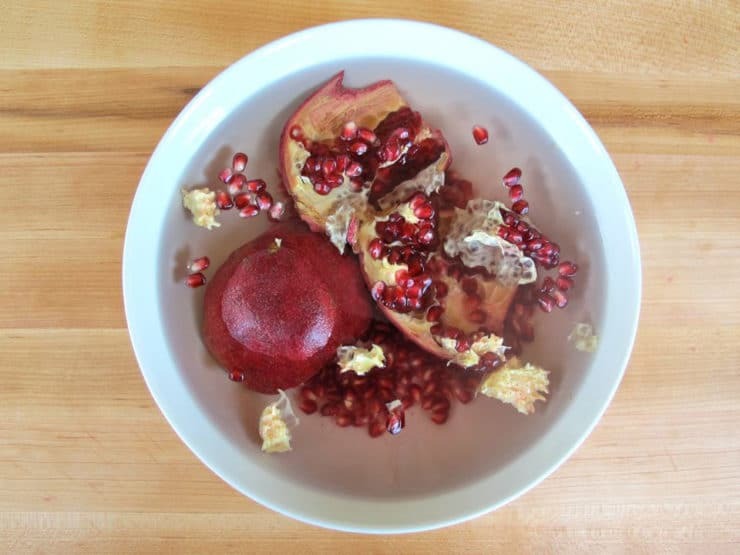 Place the pomegranate in one of the bowls. Place the other bowl nearby. Make a shallow slit at the top of the pomegranate around the crown. Cut all the way around the top of the rind, creating a shallow circle. Don't push the knife in too deep, or you may burst some seeds. Turn the pomegranate over. Repeat the process of creating a narrow slit in the rind, cutting a circle around the base of the fruit. Pull the bottom off of the fruit. Turn the pomegranate back over. You will see six white strips of pith around the edges of the fruit. Cut slits in the sides of the rind, following the lines of the pith, from the top of the fruit to the bottom. Pull the fruit apart. You will now have 8 sections of fruit (including the top and the bottom), with the seeds fully exposed. Gently loosen the seeds from the pith and place them into the clean bowl. Keep a dark-colored towel handy to clean up any juice that might escape from the seeds. Careful, pomegranate juice can stain. 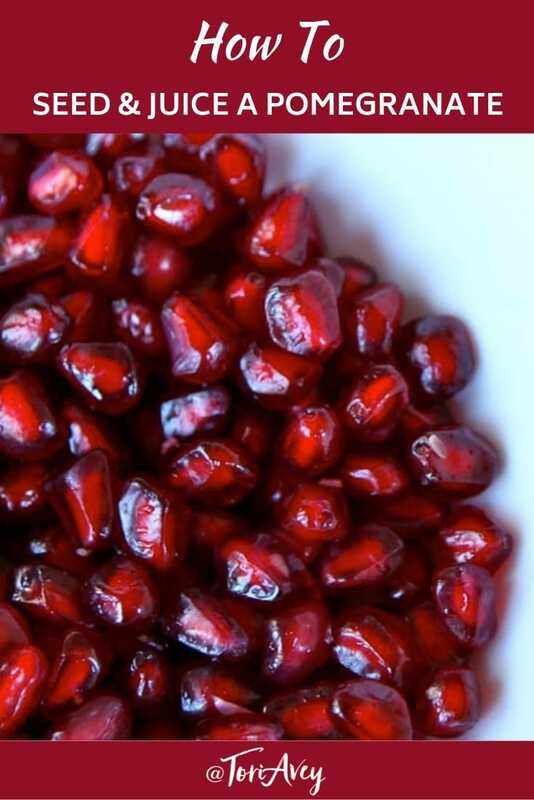 Before long, you will have a bowl full of luscious pomegranate seeds! Discard the rind and the pith. 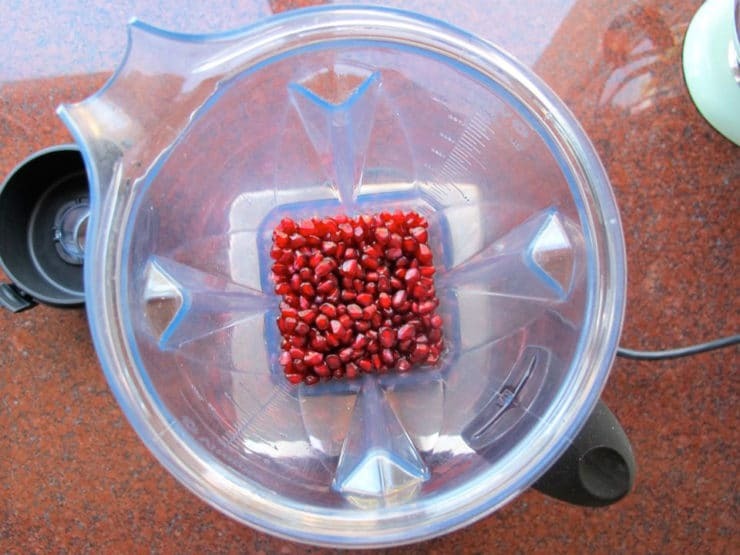 Place your pomegranate seeds in a blender. Pulse the seeds a few times to break them apart and release their juice. Don't blend them for a long period of time, or the seeds will break apart and create cloudy juice. 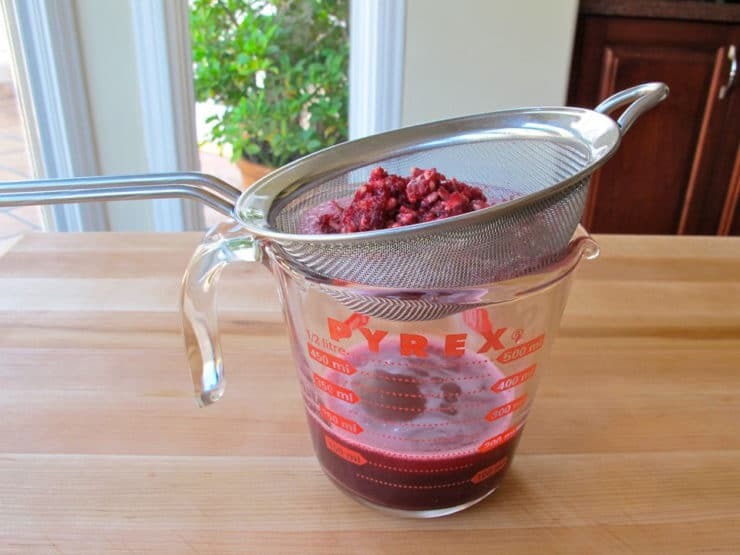 Use a mesh strainer to strain the pomegranate liquid into a container. 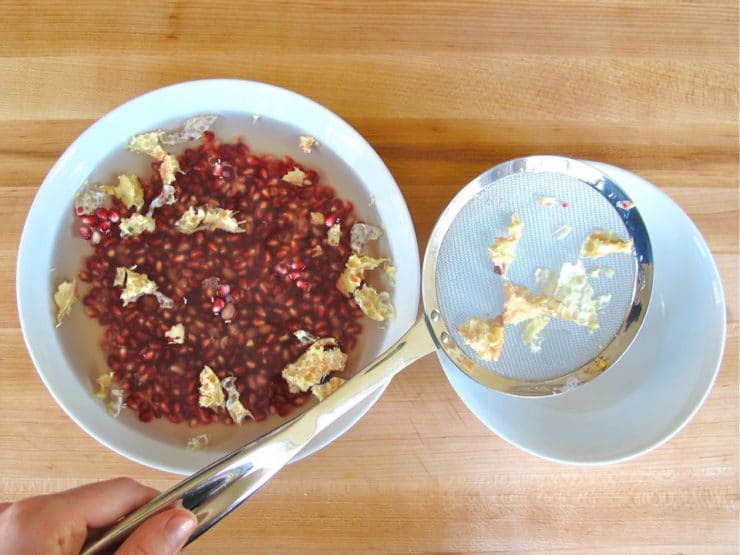 Use the back of a spoon to gently push against the pomegranate pulp and extract as much juice as possible. Chill, if desired, and enjoy. wow what a great idea…..!! 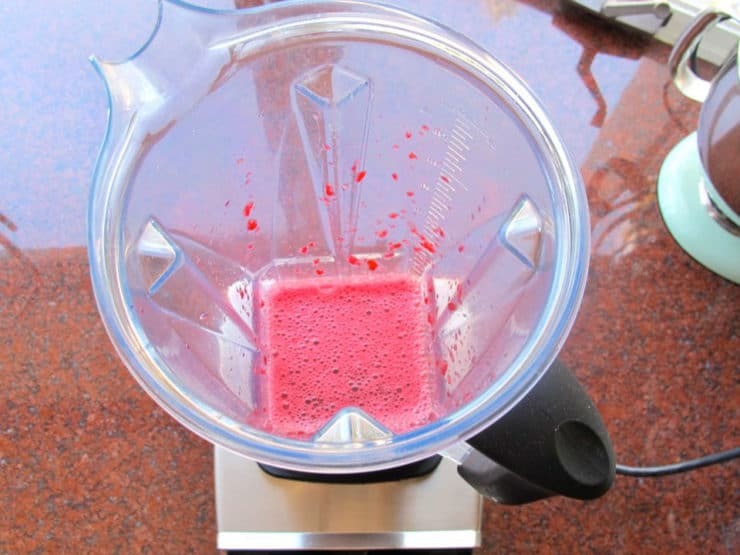 Thanks for this excellent way to make Pomegranate juice super delish! I would like to point out that store bought pomegranate juice is pasteurized for bottling. The heat of the process destroys some of the vitamins and benefits of the juice. Fresh, live juices are much more preferable and won’t upset your stomach as pasteurized juices often do. 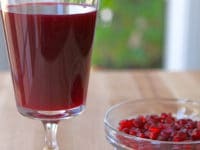 This method works great and pomegranate juice is great for arterial health. Thanks Tori! Hi! I need 1/2’cup of seeds for a recipe . 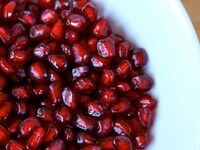 Will Inget rhat from 1 average pomegranate? Id rather not seed two if one is more than enough thansk for the seeding tips! Yes you should be able to get 1/2 cup seeds from 1 average pomegranate, although they do vary in size so I can’t say with 100% certainty. Has anyone used a juicer? I have a Omega. Thank you so much. I have pomegranates in my yard together with cashews, mangos, wild cherries, different kind of other cherries that grow in the Caribbean area. Also bananas. Off course one tree of each and I enjoy juicing or eating these fruits. Hope to make good use of your tips and willing to collaborate. Thank you! Just what I needed. I clipped a recipe for honey pomegranate glazed chicken with acorn squash.–thinking I MIGHT make it for Christmas. 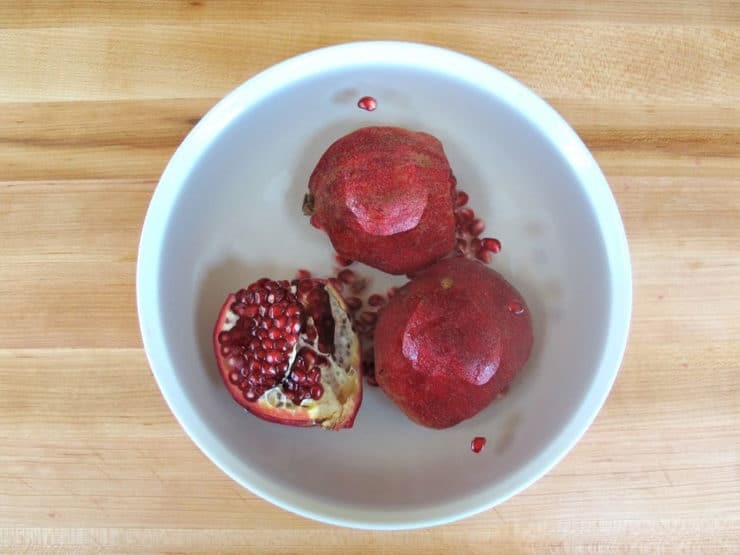 Yesterday, a friend handed me two pomegranates. Seems like it’s meant to be…. I enjoyed the article about the different ways to get the seeds out and juice the fruit! All good ideas but I gave up my blender years ago and I don’t have a cone strainer as some suggested in the comments. The one thought that came to mind was a food mill. I have my mothers and used it for many things in the past so I pulled that out and after separating all the seeds from the pod, I loosen the bolt on the bottom of the mill just to run the blade over the seeds slightly to get the juices going and then tightened it as I needed. It worked perfect for me and thought I would offer that suggestion. I even got a little bit of the fiber which added a little pulp to my juice! Very good! Dear Tori, very useful articles, thanks. Pomegranates are available cheaper in some seasons. Hence could be purchased in bulk and juice extracted in bulk. If juice extracted as per your suggestions is frozen and re-used subsequently will it retain its nutritional value? I am referring to its anti-oxidant property. 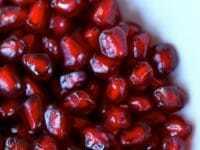 I am a heart patient and am consuming a pomegranate every morning but the chewing exercise is too cumbersome and affects dentures. Anyone throwing light on the anti-oxidant property of frozen pomegranate juice would do me a great help. Cheers and thanks to all. Hi Haren, Tori’s assistant Ashley here. Pomegranate juice will not retain it’s nutritional value when frozen. I cross cut the poms at the stem end and score the peel in quarters to the blossom end. Soak in a big bowl (or sink) 20 minutes or so. Just crack them open and the seeds come out nicely, put in bowl. I use my juice extractor to separate the juice from the seeds, works nicely, skim off foam, and use for jelly, liqueur, syrup, whatever. Thank you, I was wondering if a juicer would work. 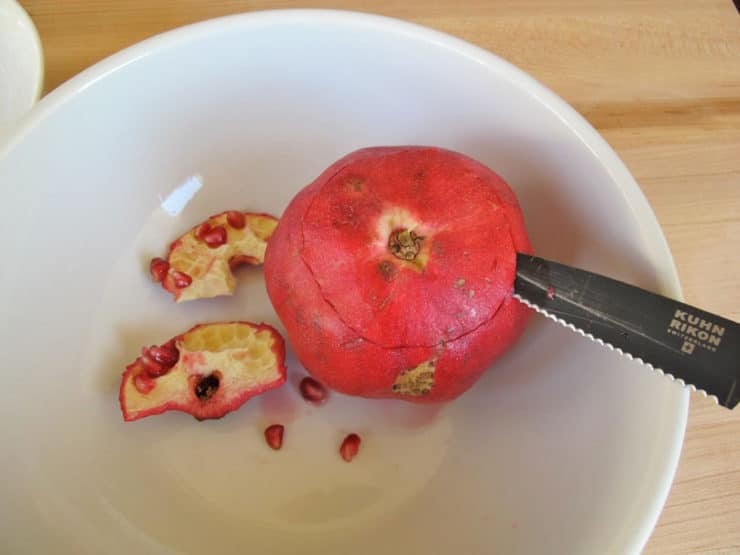 The fastest/easiest way I have seen to remove the seeds from a pomegranate is the following. 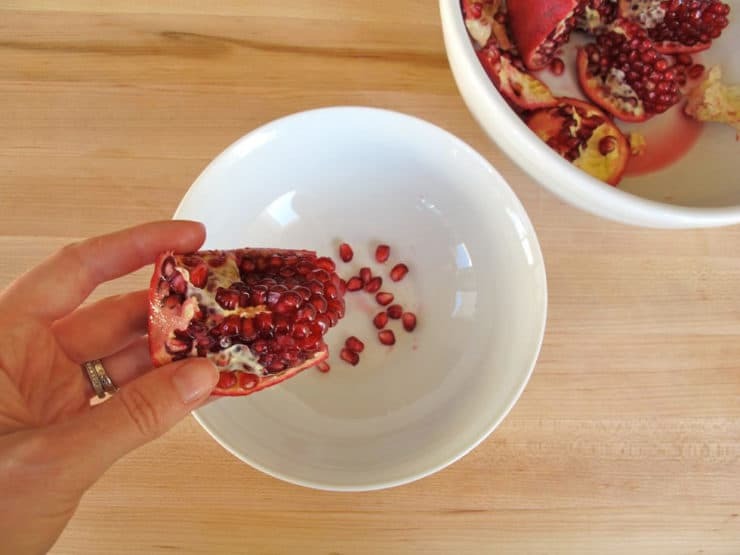 Cut pomegranate in half longitudinally. Hold cut side down in your hand, palm up, fingers spread. Take wooden spoon in the other hand. 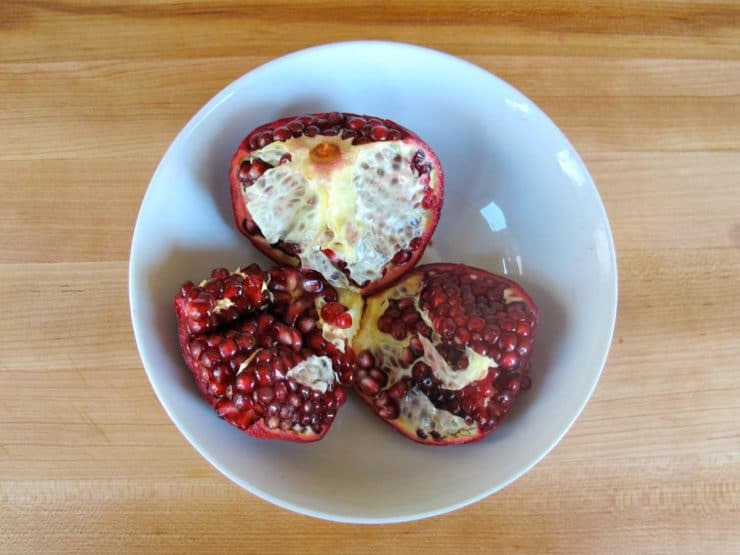 Slap the back of the pomegranate with the spoon seeds will fly right out. Catch the seeds in a bowl with water. Any pith that comes out will separate from seeds in the water. 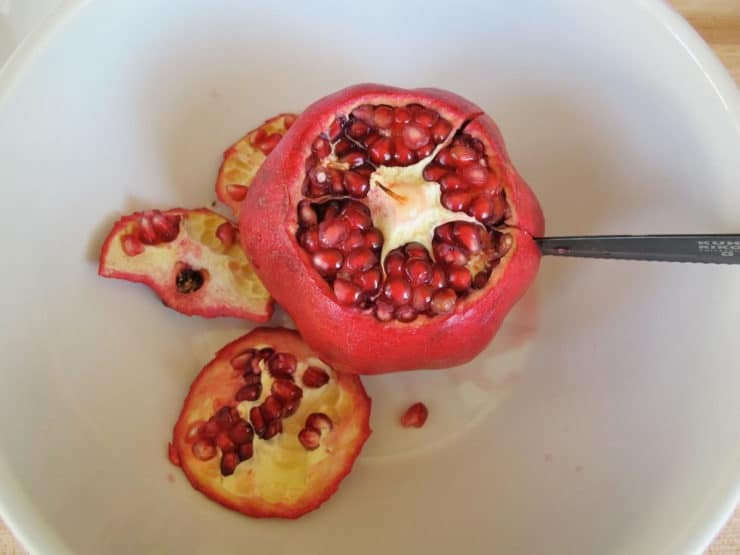 It takes less than 2 minutes to seed a whole pomegranate. If you try this you will love it. I cook for a Living this method has saved my prep cooks many hours. Not that I know of… but you might want to ask a nutritionist to be safe. I just got through seeding and juicing 4 gal of pom juice, what to do with the seed/pulp after squeezing the juice from the arils. There is still a little juice in the strained remains. I use a cone strainer with the matching wooden pestil into a food grade 5gal bucket. Jack, did you use the blender method, or just the cone and strainer? I have 26 cups of arils to process. thank you so much, Tori, for sharing this ultimate healthy recipe. I will surely make this. cheers! After blending the Pomo arils and squeezing the remnant in a cloth, I find there is still some pulp and white seed left out in the cloth. I think these white seeds are very good too if so, how to separate these white seeds from the pulp. Oh dear, that sounds to me like it’s gone bad Evelyn. Safest to toss it, I think– unless there is another type of pomegranate out there I am unfamiliar with! I’ve never seen one black before.